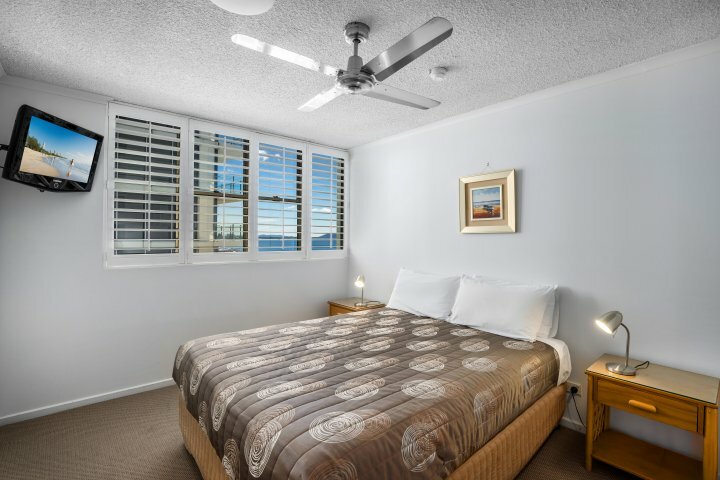 Pacific Beach Resort Mooloolaba, in the heart of Mooloolaba, offers superb value for money, with our beachfront resort offering you all the facilities you need to really enjoy your Mooloolaba Beach holiday. As seen on Channel Nines "Getaway" travel program.....how is that for a recommendation! 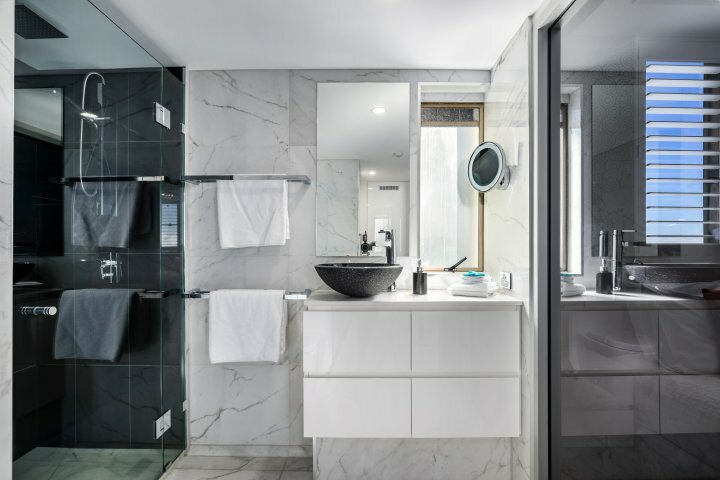 Stroll around the boutique shops, have a coffee at one of the al-fresco restaurants or just laze around the heated swimming pool, enjoy a BBQ, a game of tennis or just relax in the spa or sauna. 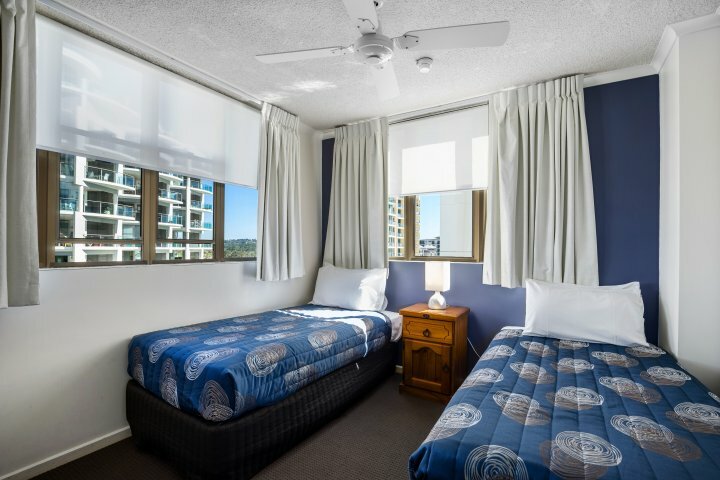 Pacific Beach resort offers spacious 1, 2 & 3 bedroom holiday accommodation apartments, all with Ocean views, each with washing machine, clothes dryer, cable TV, dishwasher and ensuite to the main bedroom, and the resort features a large recreation room, equipped with pool table and a variety of video games. 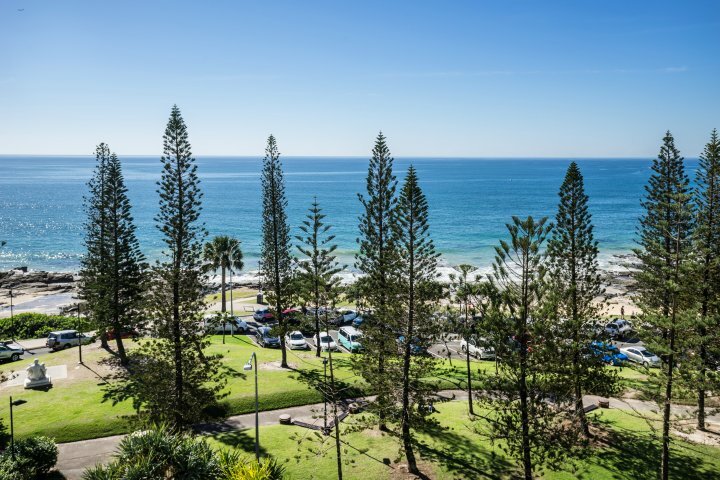 No need for a car..at our Mooloolaba holiday apartments, everything is only a short stroll away. 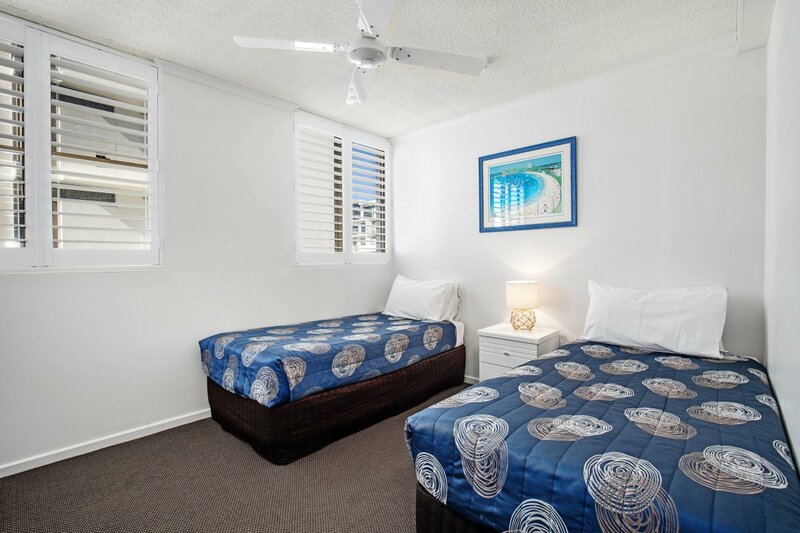 Free Wi-Fi -- This fully self contained apartment has 180 degrees ocean views from Point Cartwright to Noosa. Located on the front of the building over Mooloolaba Esplanade. 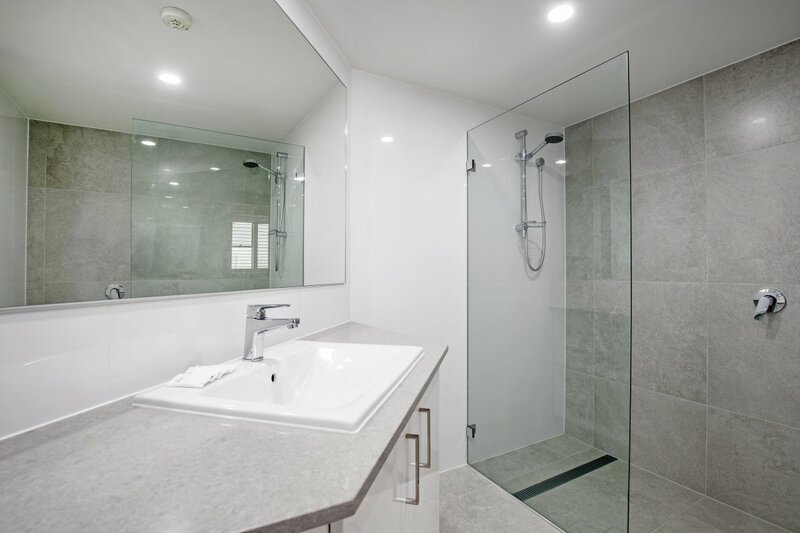 All our 1 bedroom suites are actually 2 bedroom apartments with the second bedroom and ensuite closed off..so you get a large apartment with full kitchen facilities, lounge and dining areas and a bathroom with laundry facilities. 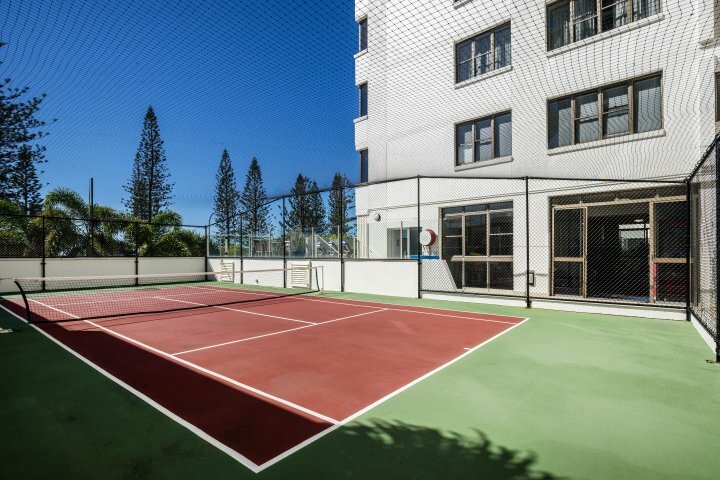 All this in the heart of Mooloolaba amongst the boutique shops and al fresco dining. 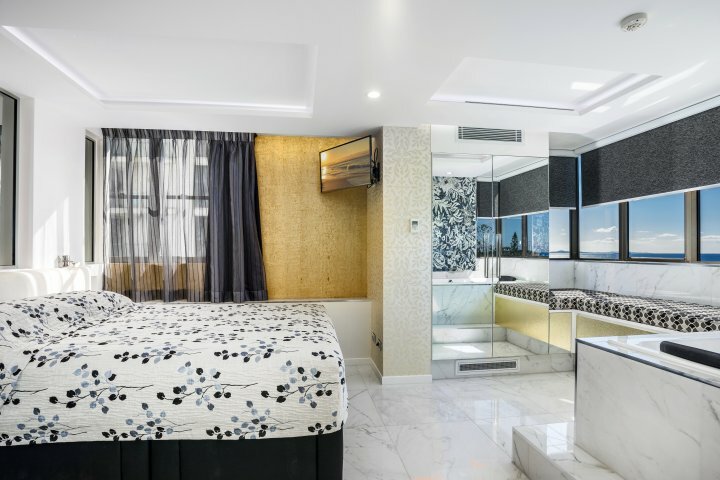 To Receive Discount 1) Tariff must be paid in full at time of Booking 2) Accommodation is Non Refundable and Non Transferable 3) Arrival date must be 60 days in advance. 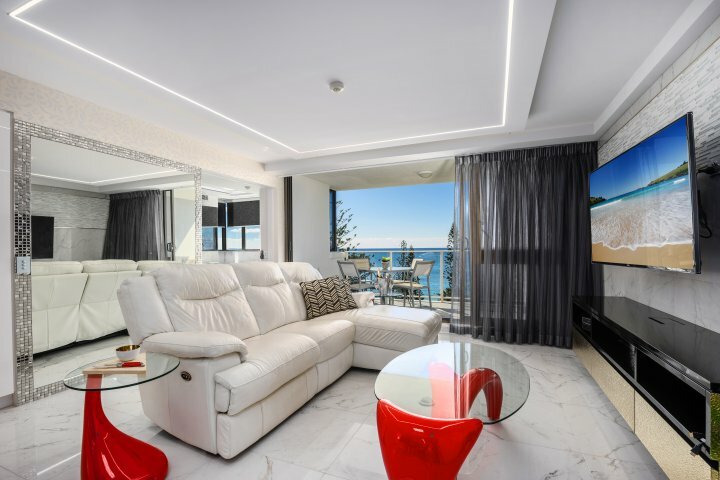 This fully self contained apartment has 180 degrees ocean views from Point Cartwright to Noosa. Located on the front of the building over Mooloolaba Esplanade. 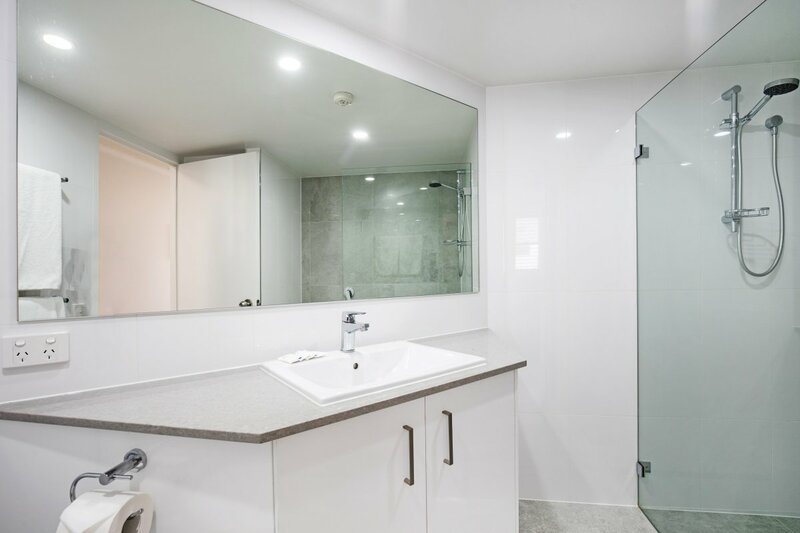 All our 1 bedroom suites are actually 2 bedroom apartments with the second bedroom and ensuite closed off..so you get a large apartment with full kitchen facilities, lounge and dining areas and a bathroom with laundry facilities. 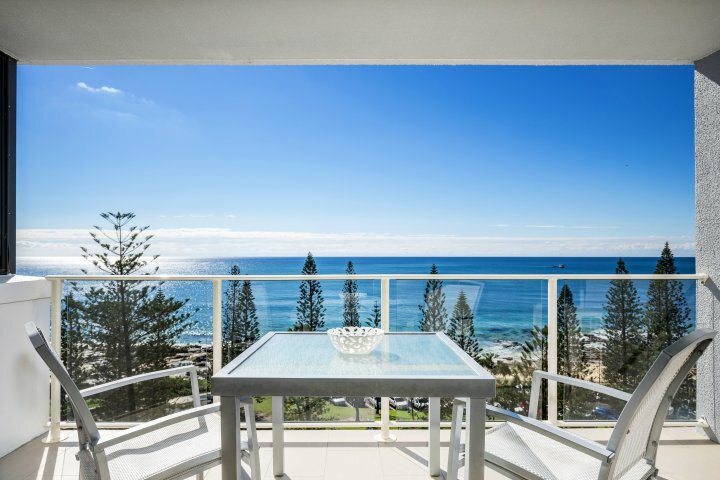 All this in the heart of Mooloolaba amongst the boutique shops and al fresco dining. Free Wi-Fi -- This fully self contained apartment has a spacious courtyard to relax and unwind on. 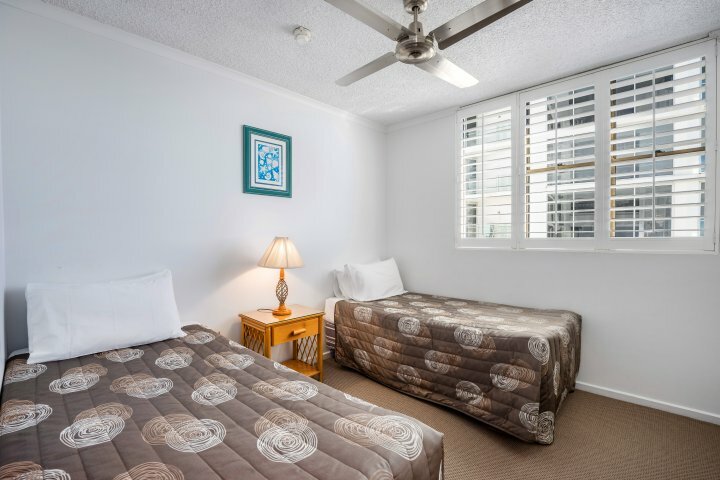 Located on the pool level of the building right on Mooloolaba Esplanade. 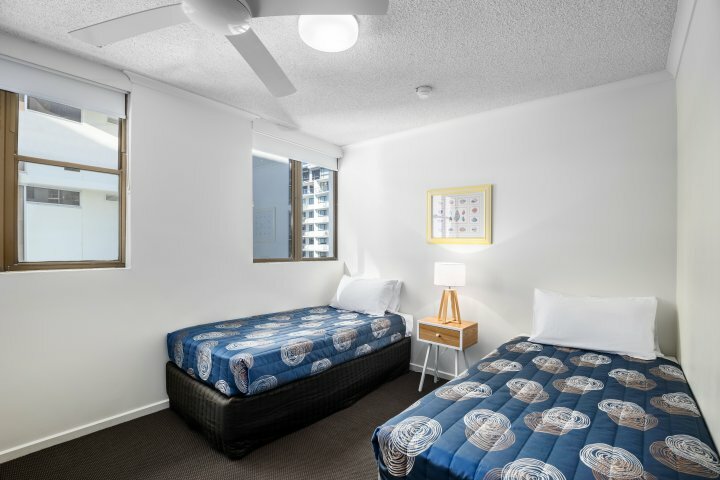 All our 1 bedroom suites are actually 2 bedroom apartments with the second bedroom....so you get a large apartment with full kitchen facilities, lounge and dining areas and a bathroom with laundry facilities. 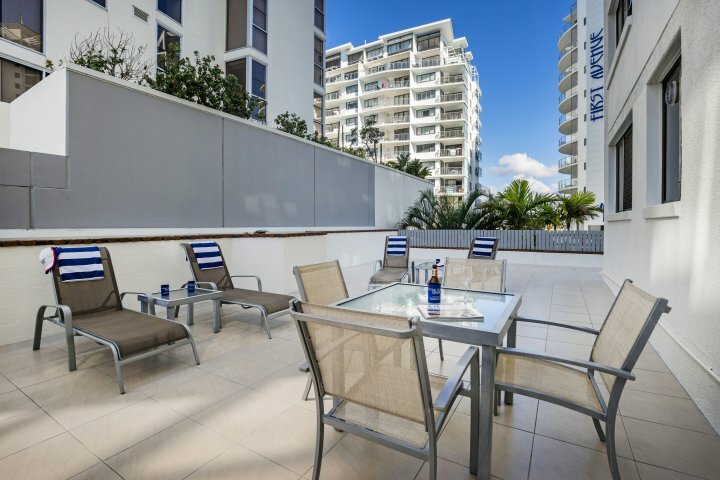 All this in the heart of Mooloolaba amongst the boutique shops and al fresco dining. 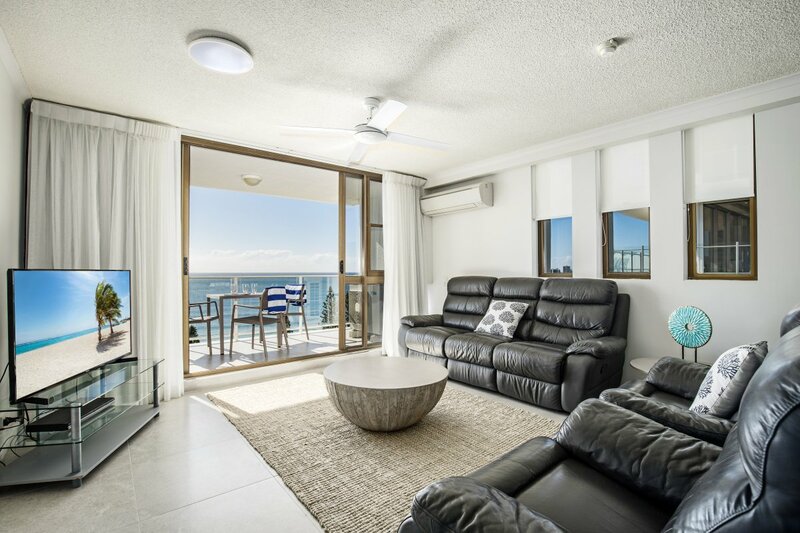 Free Wi-Fi -- This fully self contained apartment has 90 degree ocean views directly in front & to the left towards the Northern coastline through to Coolum and Noosa. Slightly set back from the front of the building. 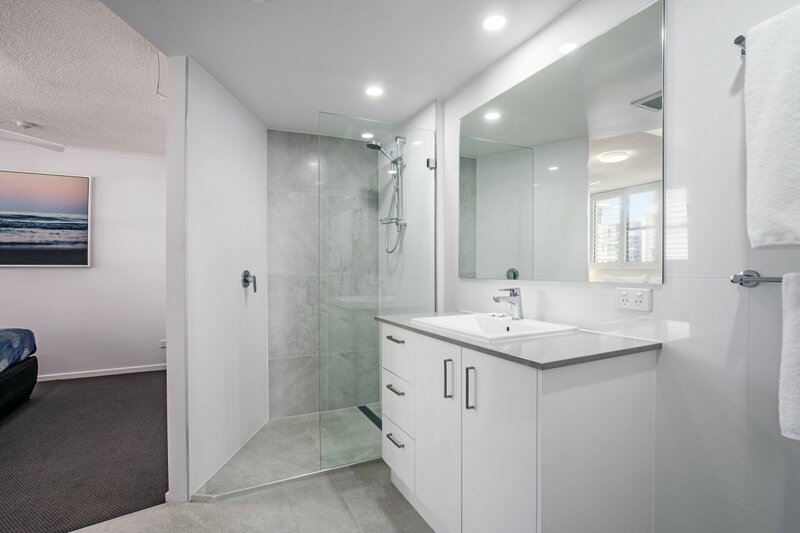 All our 1 bedroom suites are actually 2 bedroom apartments with the second bedroom and ensuite closed off..so you get a large apartment with full kitchen facilities, lounge and dining areas and a bathroom with laundry facilities. 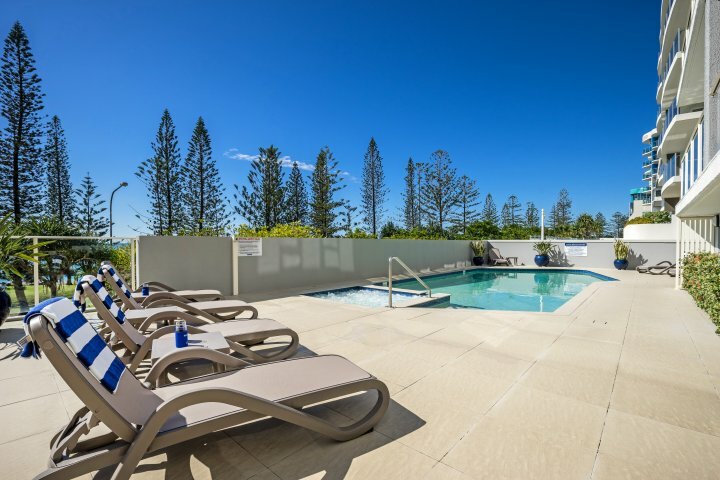 All this in the heart of Mooloolaba amongst the boutique shops and al fresco dining. 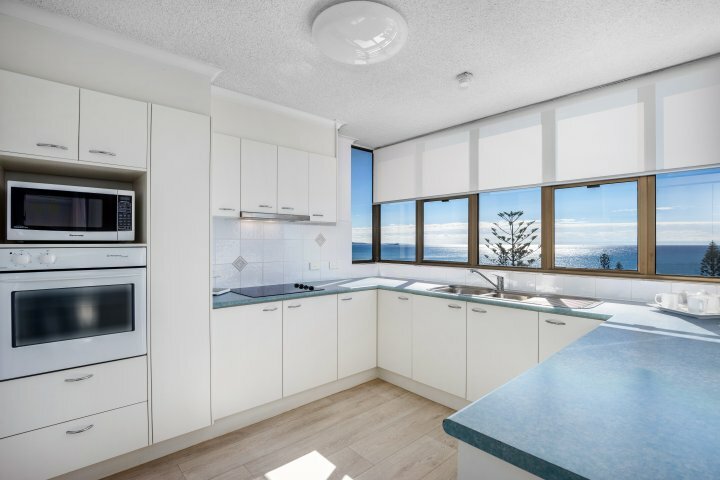 Free Wi-Fi -- This Fully Refurbished Apartment located on the 5th Floor has 180 degrees ocean views from Point Cartwright to Noosa. Located on the front of the building over Mooloolaba Esplanade. This spacious apartment has an open plan living area, full kitchen and laundry facilities, dining room and a fantastic bathroom. Big Screen TV in Master Bedroom with ensuite. 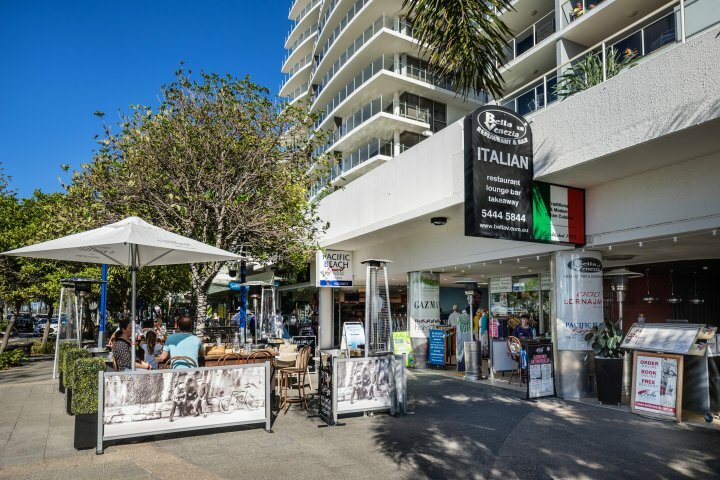 All this in the heart of Mooloolaba amongst the boutique shops and al fresco dining. Bedding is 1 x Queen Bed. Maximum allowable guests is 2. 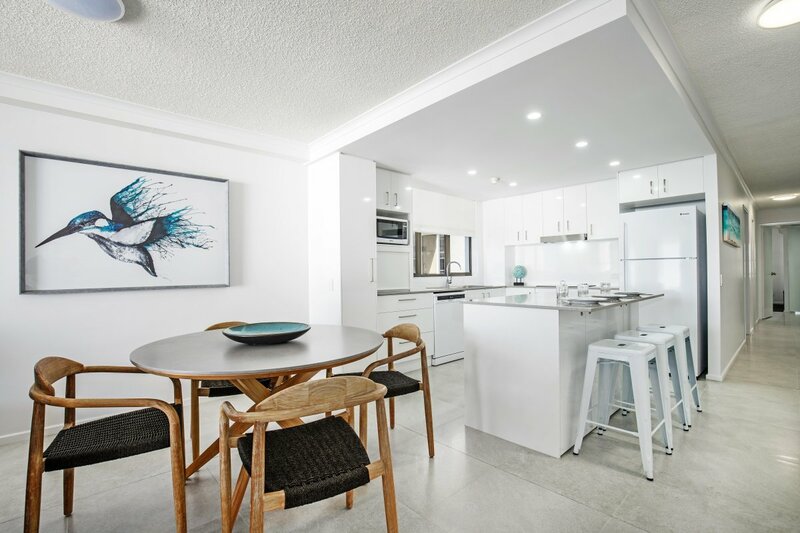 Free Wi-Fi -- This Fully Refurbished Air Conditioned Apartment (additional a/c in Master Bedroom) is located on the 8th Floor with a 90 degree ocean view directly in front & to the left towards the Northern coastline through to Coolum and Noosa. 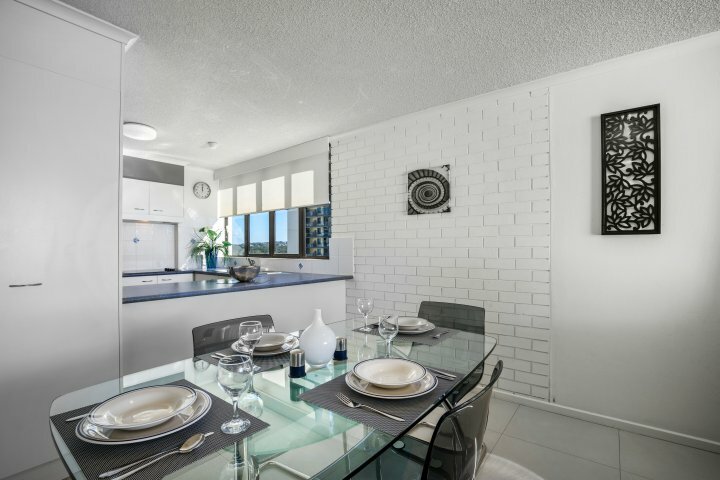 This large apartment has full kitchen (inc Expresso Coffee Machine BYO Pods) and laundry facilities, lounge and dining areas, ensuite and a bathroom. The apartment is slightly set back from the front of the building. 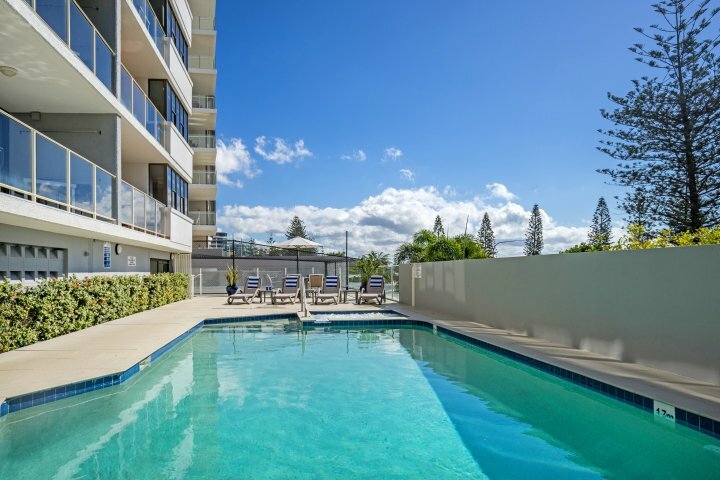 All this in the heart of Mooloolaba amongst the boutique shops and al fresco dining. Bedding is 1 x Queen Bed. Maximum allowable guests is 2. To Receive Discount 1) Tariff must be paid in full at time of Booking 2) Accommodation is Non Refundable and Non Transferable 3) Arrival date must be 60 days in advance. 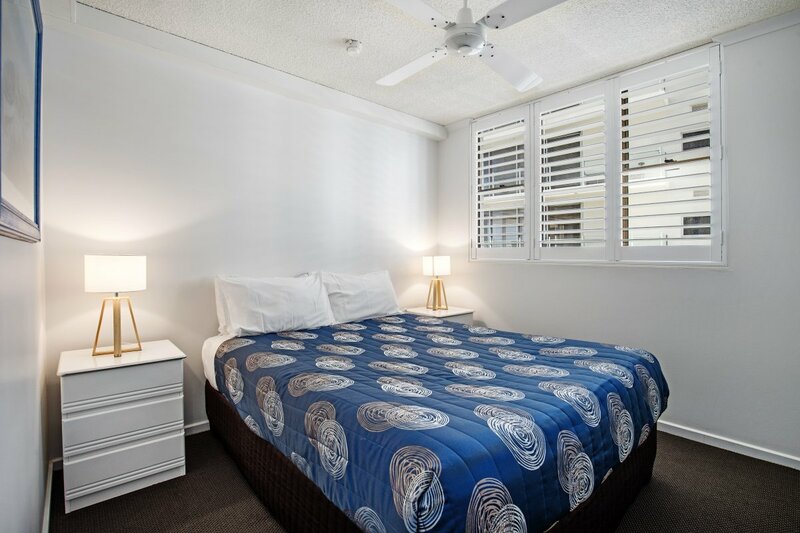 Free Wi-Fi -- This Fully Refurbished Air Conditioned Apartment (additional a/c in Master Bedroom) is located on the 8th Floor with a 90 degree ocean view directly in front & to the left towards the Northern coastline through to Coolum and Noosa. 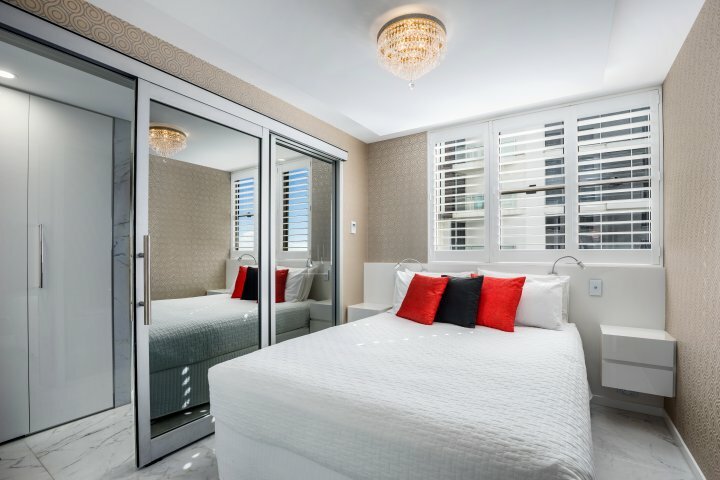 This large apartment has full kitchen (inc Expresso Coffee Machine BYO Pods) and laundry facilities, lounge and dining areas, ensuite and a bathroom. The apartment is slightly set back from the front of the building. 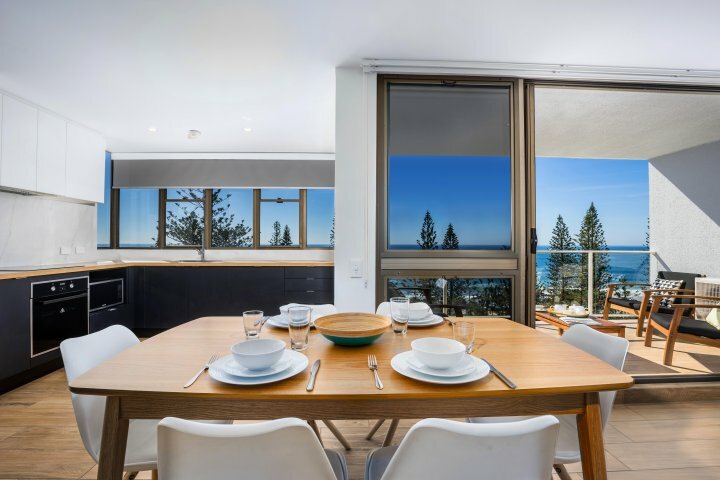 All this in the heart of Mooloolaba amongst the boutique shops and al fresco dining. Bedding is 1 x Queen Bed. Maximum allowable guests is 2. 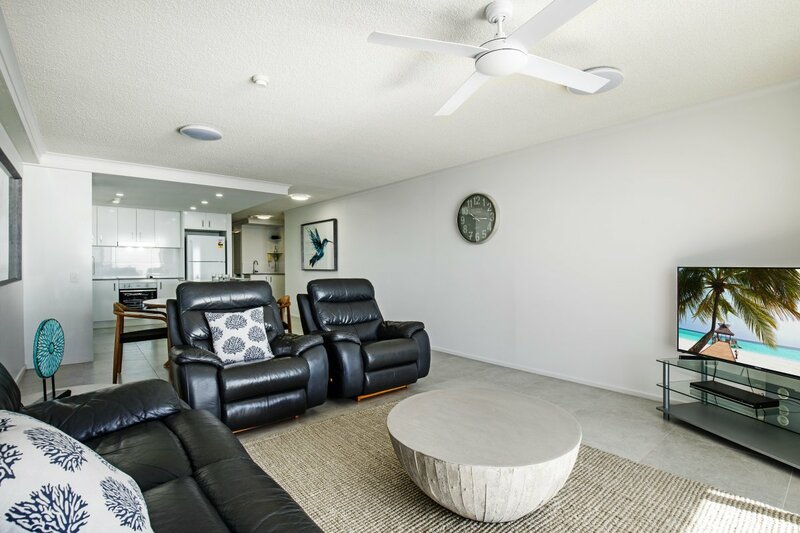 Free Wi-Fi -- This fully self contained apartment has 180 degrees ocean views from Point Cartwright to Noosa. Located on the front of the building over Mooloolaba Esplanade.. 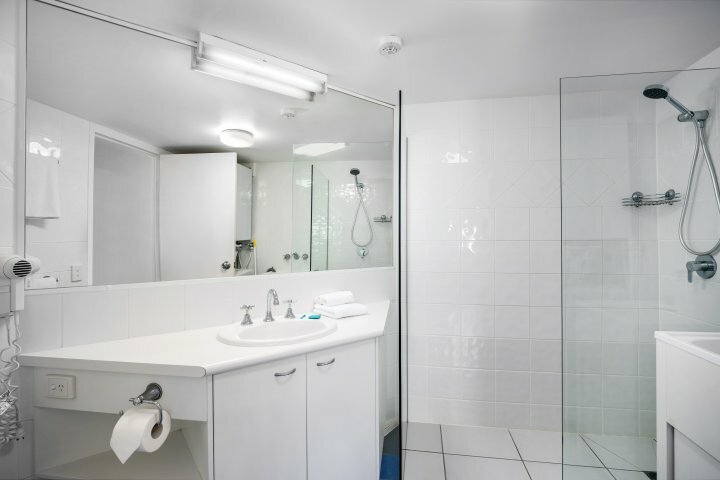 These are a large apartment with full kitchen facilities, lounge and dining areas, ensuite and a bathroom with laundry facilities. 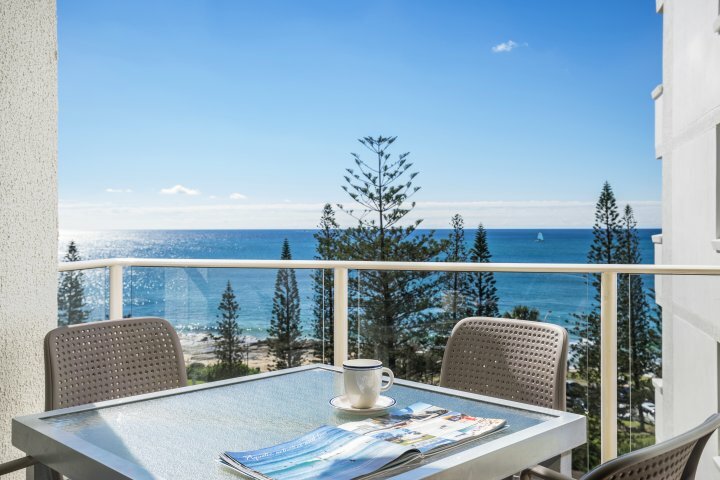 All this in the heart of Mooloolaba amongst the boutique shops and al fresco dining. To Receive Discount 1) Tariff must be paid in full at time of Booking 2) Accommodation is Non Refundable and Non Transferable 3) Arrival date must be 60 days in advance. 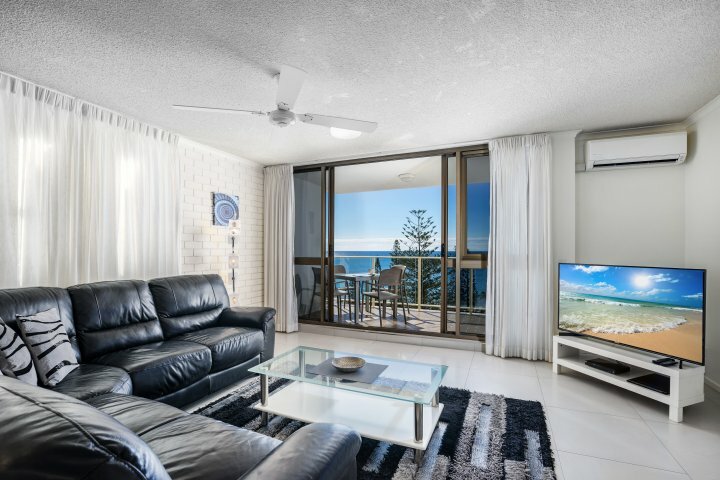 This fully self contained apartment has 180 degrees ocean views from Point Cartwright to Noosa. Located on the front of the building over Mooloolaba Esplanade.. 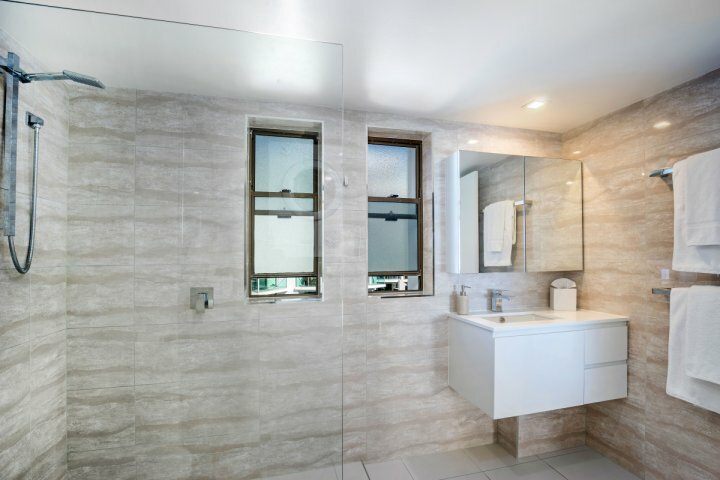 These are a large apartment with full kitchen facilities, lounge and dining areas, ensuite and a bathroom with laundry facilities. 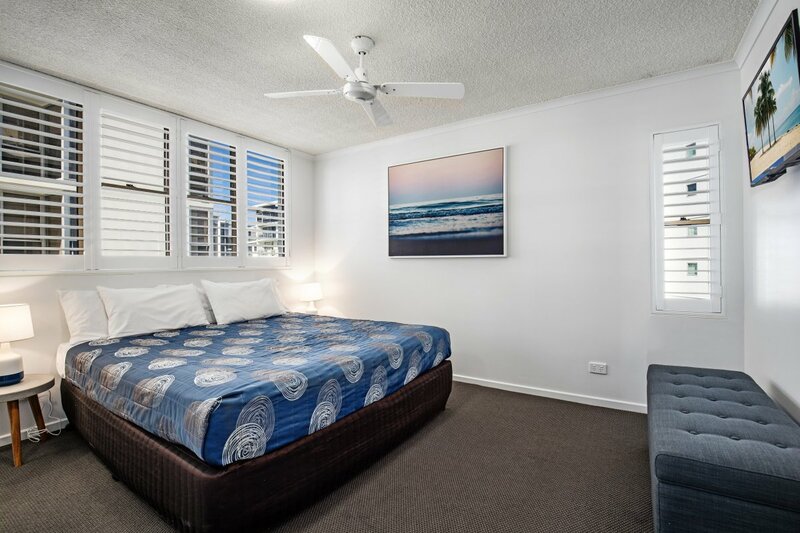 All this in the heart of Mooloolaba amongst the boutique shops and al fresco dining. 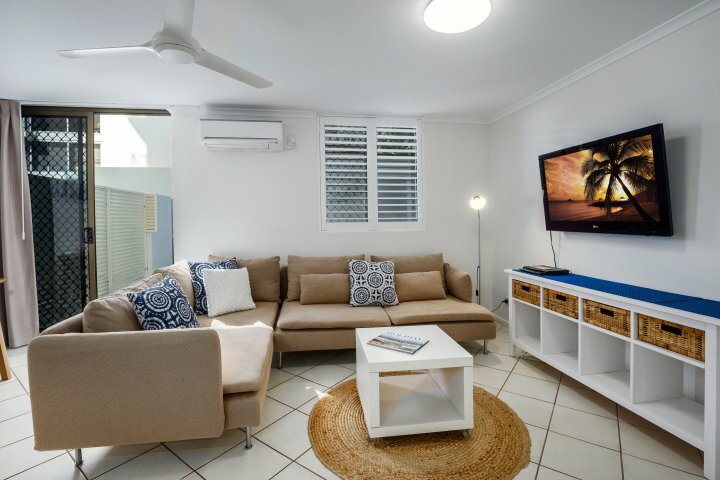 Free Wi-Fi -- This fully self contained apartment has a spacious courtyard to relax and unwind on. 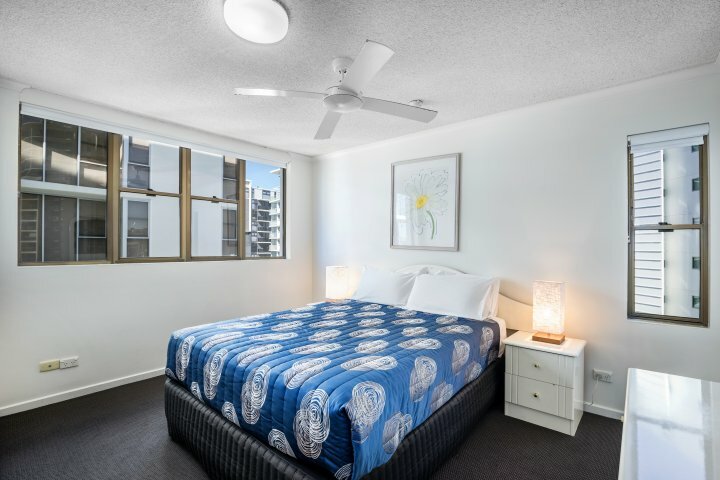 Located on the pool level of the building right on Mooloolaba Esplanade. Large apartment with full kitchen facilities, lounge and dining areas and a bathroom (1 Only) with laundry facilities. 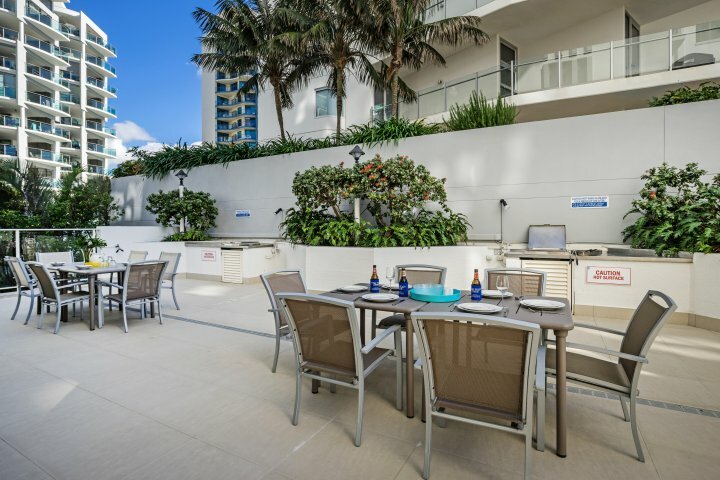 All this in the heart of Mooloolaba amongst the boutique shops and al fresco dining. 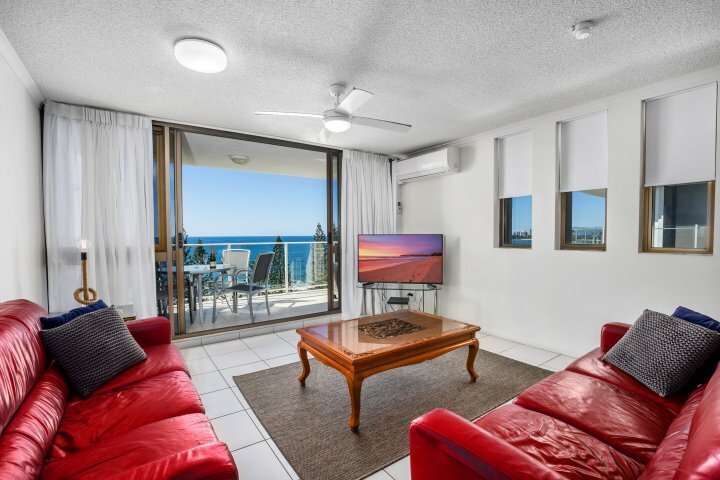 Free Wi-Fi -- This fully self contained apartment has 90 degree ocean views directly in front & to the left towards the Northern coastline through to Coolum and Noosa. Slightly set back from the front of the building. 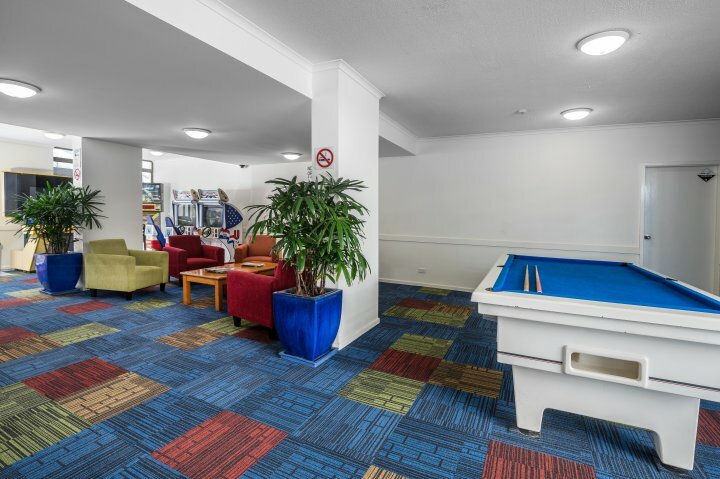 These are a large apartment with full kitchen facilities, lounge and dining areas, ensuite and a bathroom with laundry facilities. 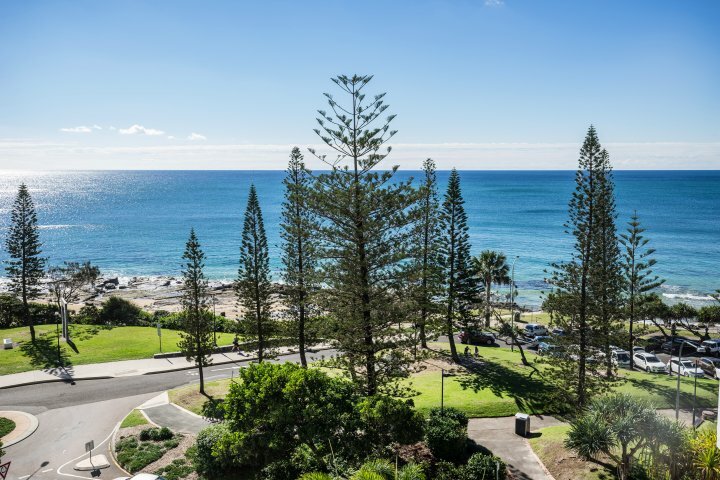 All this in the heart of Mooloolaba amongst the boutique shops and al fresco dining. To Receive Discount 1) Tariff must be paid in full at time of Booking 2) Accommodation is Non Refundable and Non Transferable 3) Arrival date must be 60 days in advance. 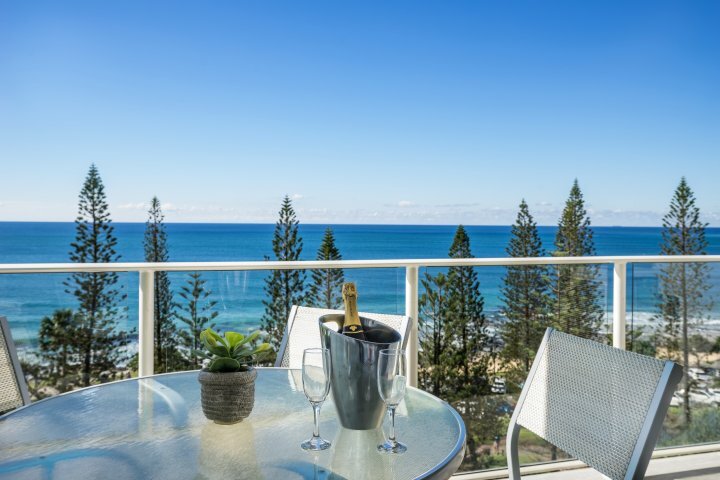 This fully self contained apartment has 90 degree ocean views directly in front & to the left towards the Northern coastline through to Coolum and Noosa. Slightly set back from the front of the building. 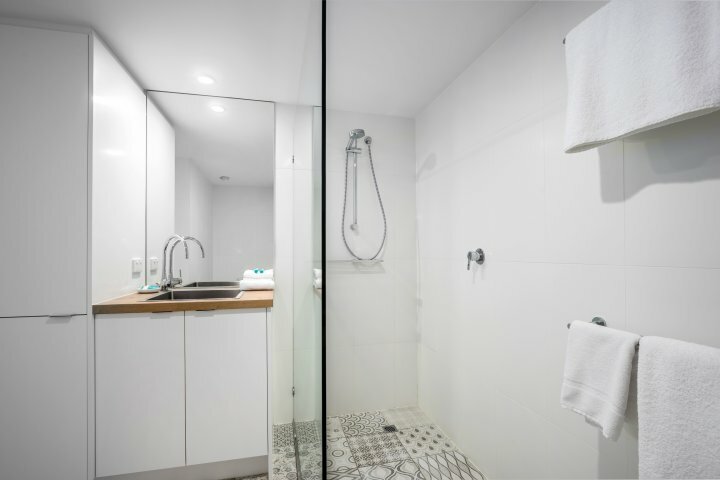 These are a large apartment with full kitchen facilities, lounge and dining areas, ensuite and a bathroom with laundry facilities. 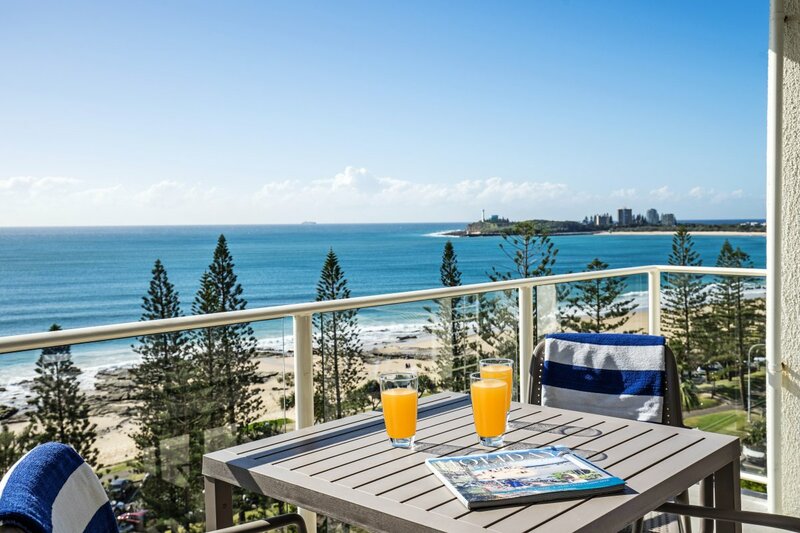 All this in the heart of Mooloolaba amongst the boutique shops and al fresco dining. 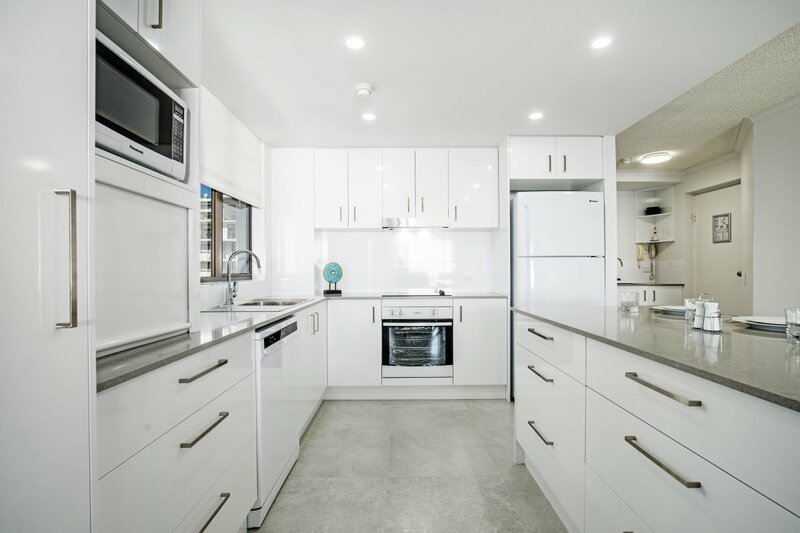 Free Wi-Fi -- This Fully Refurbished Apartment located on the 5th Floor has 180 degrees ocean views from Point Cartwright to Noosa. Located on the front of the building over Mooloolaba Esplanade. This spacious apartment has an open plan living area, full kitchen and laundry facilities, dining room and a fantastic bathroom. Big Screen TV in Master Bedroom with ensuite. 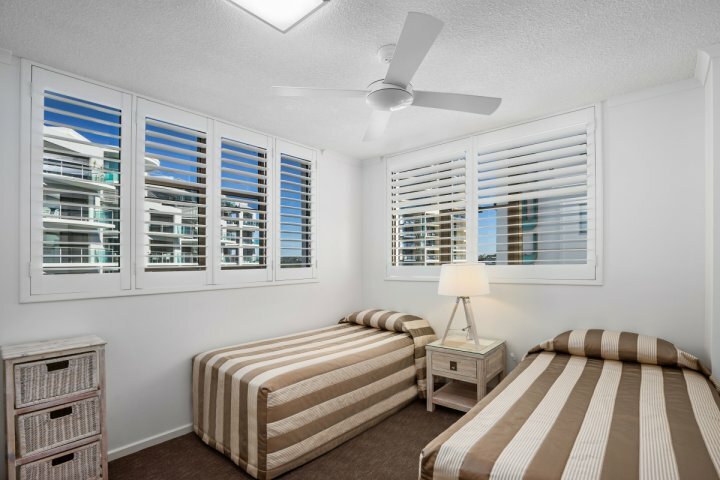 All this in the heart of Mooloolaba amongst the boutique shops and al fresco dining. Bedding is 1 x Queen Bed and 1 x Bunk Bed. Maximum allowable adults is 2. Maximum allowable Children is 3. 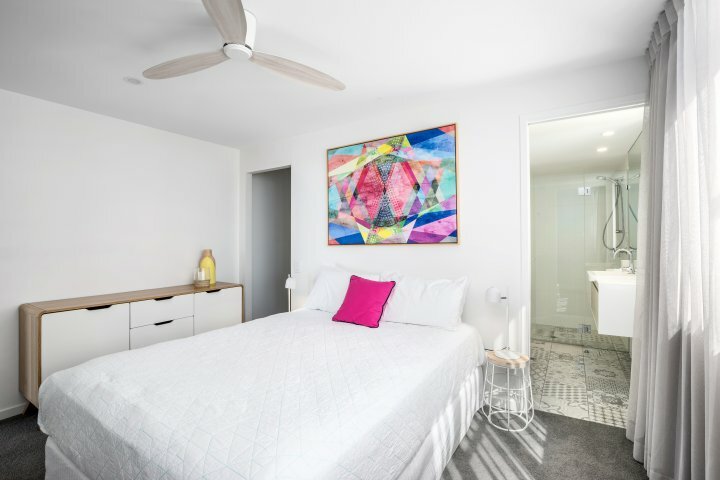 Free Wi-Fi -- This Fully Refurbished Air Conditioned Apartment (additional a/c in Master Bedroom) is located on the 8th Floor with a 90 degree ocean view directly in front & to the left towards the Northern coastline through to Coolum and Noosa. 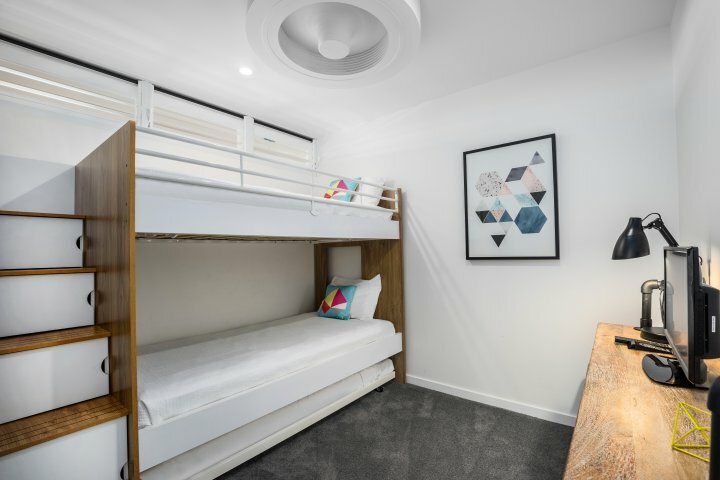 This large apartment has full kitchen (inc Expresso Coffee Machine BYO Pods) and laundry facilities, lounge and dining areas, ensuite and a bathroom. The apartment is slightly set back from the front of the building. 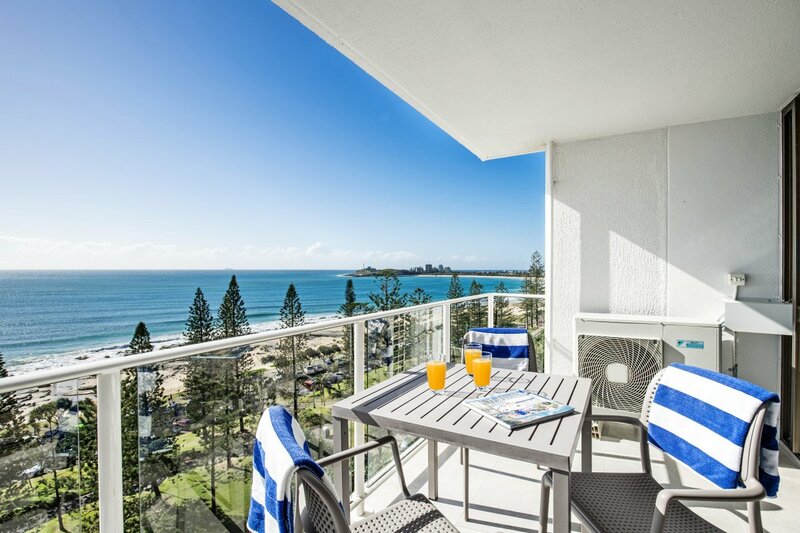 All this in the heart of Mooloolaba amongst the boutique shops and al fresco dining. Bedding is 1 x Queen Bed & 2 Single Beds. Maximum allowable guests is 4. To Receive Discount 1) Tariff must be paid in full at time of Booking 2) Accommodation is Non Refundable and Non Transferable 3) Arrival date must be 60 days in advance. 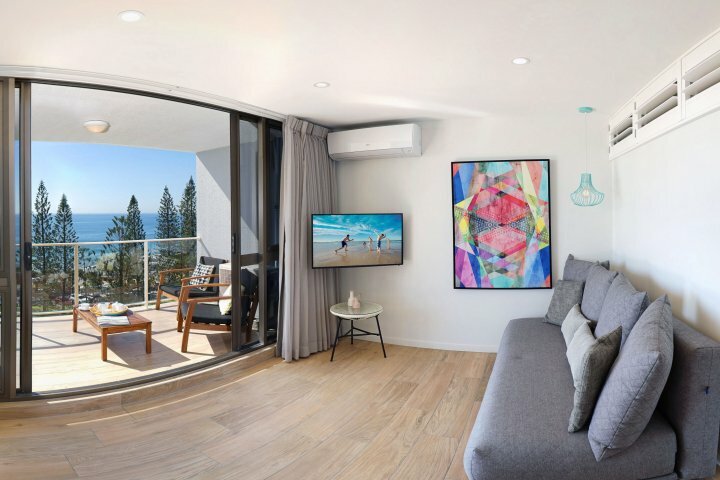 Free Wi-Fi -- This Fully Refurbished Air Conditioned Apartment (additional a/c in Master Bedroom) is located on the 8th Floor with a 90 degree ocean view directly in front & to the left towards the Northern coastline through to Coolum and Noosa. 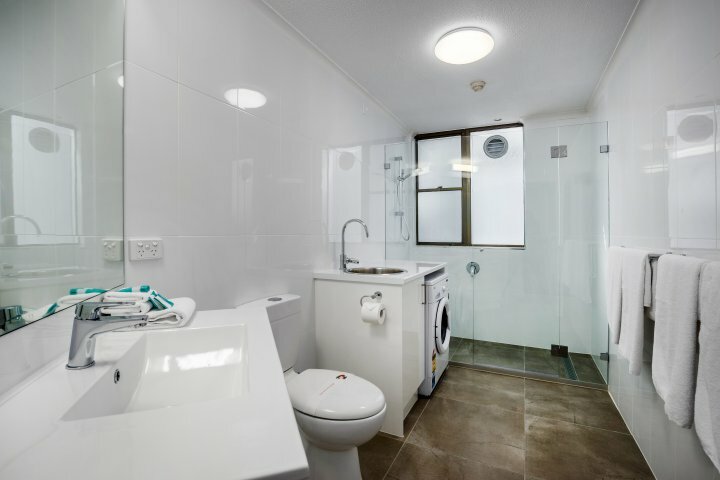 This large apartment has full kitchen (inc Expresso Coffee Machine BYO Pods) and laundry facilities, lounge and dining areas, ensuite and a bathroom. The apartment is slightly set back from the front of the building. 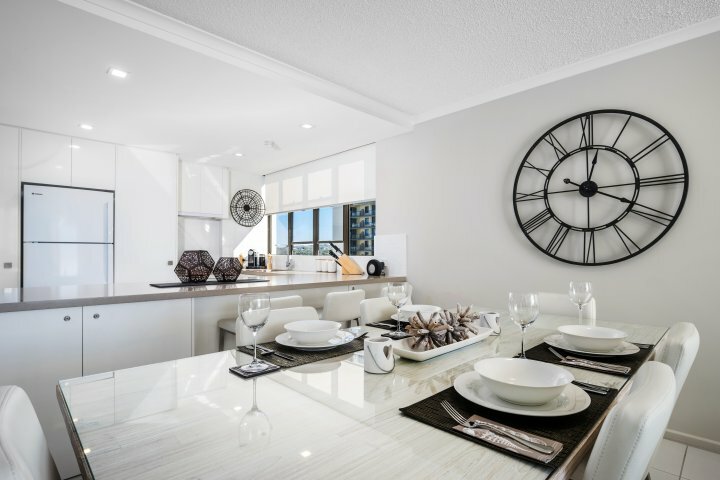 All this in the heart of Mooloolaba amongst the boutique shops and al fresco dining. Bedding is 1 x Queen Bed & 2 Single Beds. Maximum allowable guests is 4. 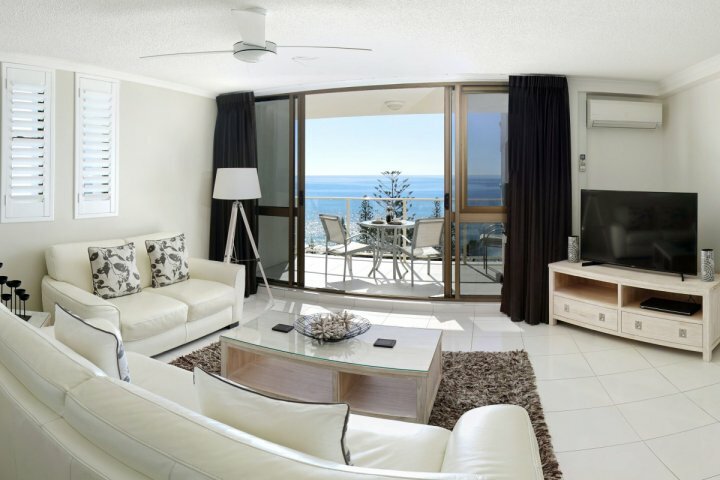 Free Wi-Fi -- This fully self contained apartment has 180 degrees ocean views from Point Cartwright to Noosa. Located on the front of the building over Mooloolaba Esplanade. 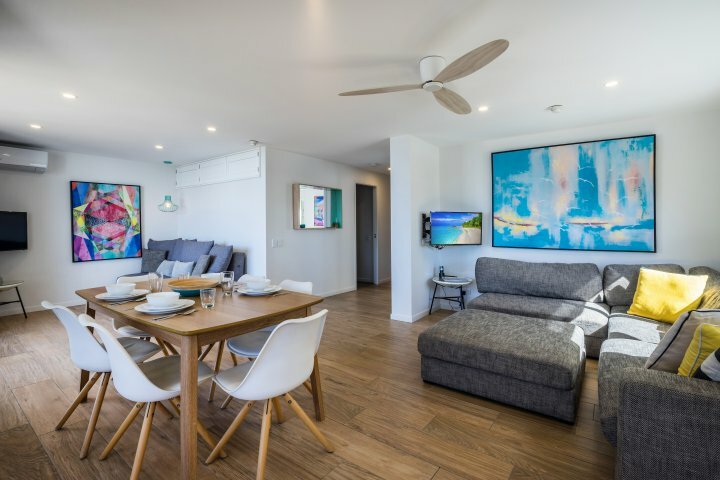 These are a large apartment with full kitchen facilities, lounge and dining areas, ensuite and a bathroom with laundry facilities. 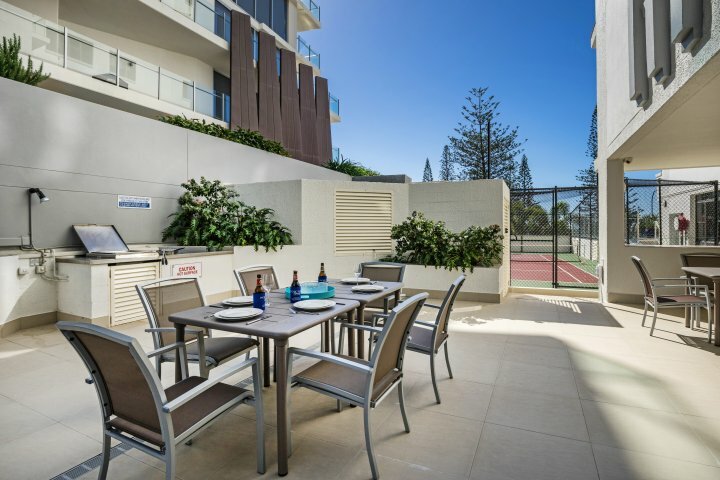 All this in the heart of Mooloolaba amongst the boutique shops and al fresco dining. To Receive Discount 1) Tariff must be paid in full at time of Booking 2) Accommodation is Non Refundable and Non Transferable 3) Arrival date must be 60 days in advance. 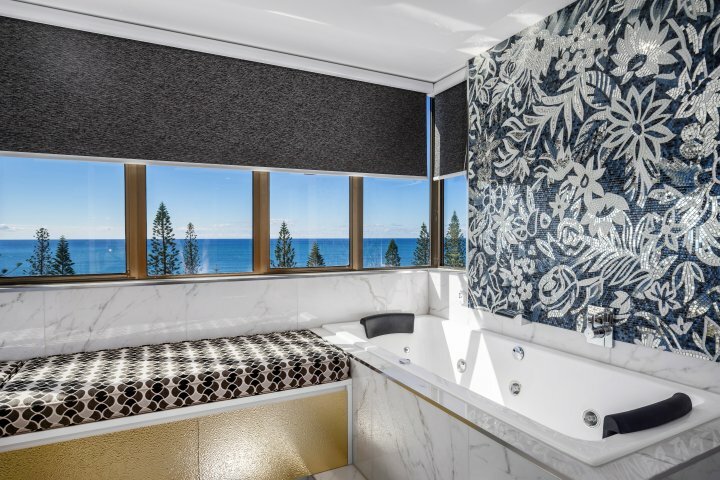 This fully self contained apartment has 180 degrees ocean views from Point Cartwright to Noosa. Located on the front of the building over Mooloolaba Esplanade. 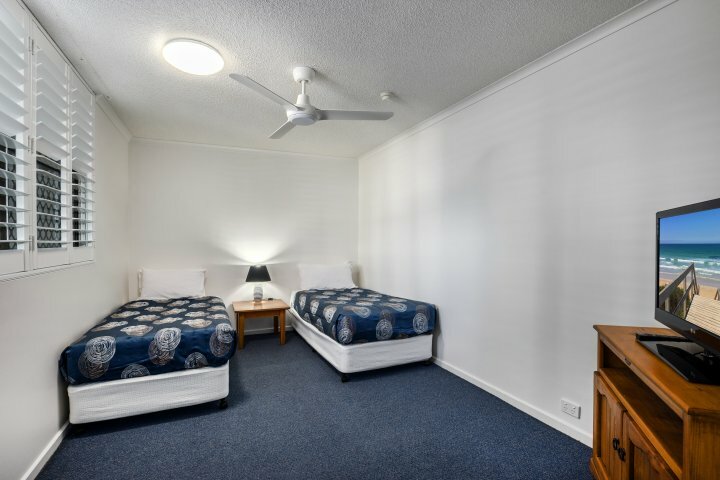 These are a large apartment with full kitchen facilities, lounge and dining areas, ensuite and a bathroom with laundry facilities. 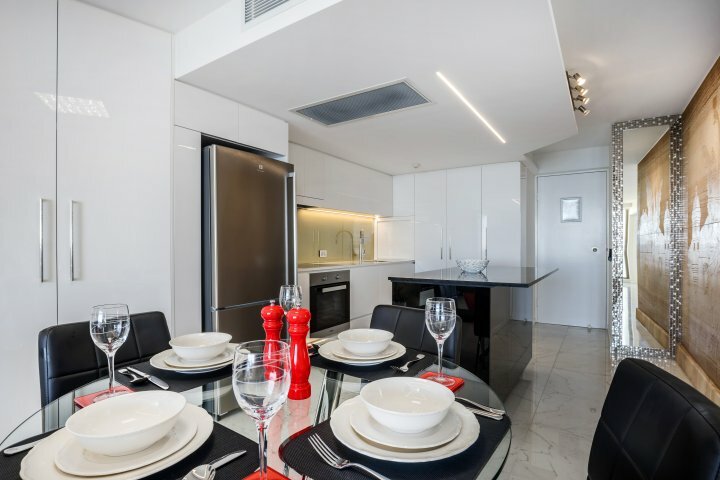 All this in the heart of Mooloolaba amongst the boutique shops and al fresco dining. 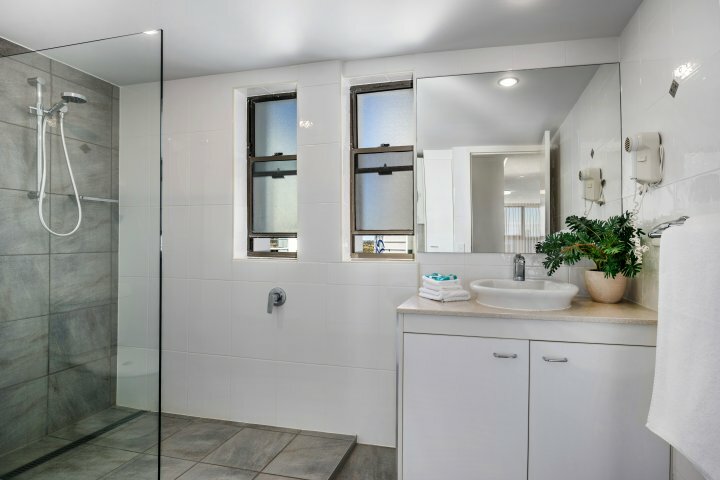 Free Wi-Fi -- Luxury Apartment with Direct Ocean Views and Ducted Air Conditioning. 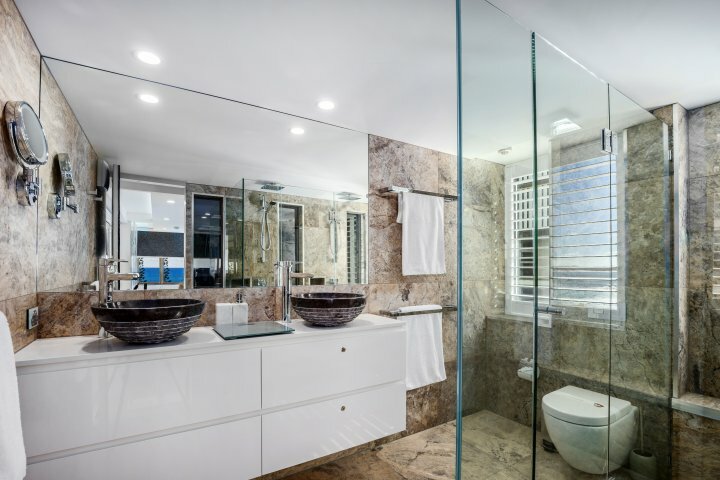 Lavish ensuites off both bedrooms, ocean front facing master bedroom with his and her showers & basins as well as a spa bath with mood lighting. 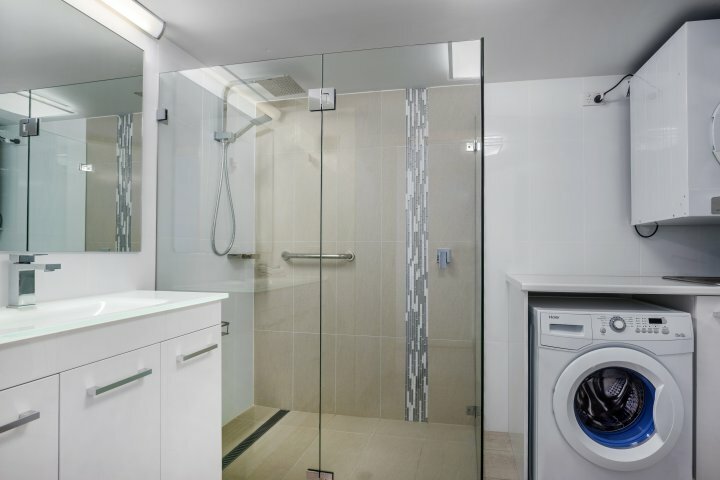 Fully self-contained with high quality kitchen appliances and laundry facilities. Relax in Electric leather recliner in lounge room listening to your music with the Bluetooth Speakers surrounded by colour changing mood lighting. PLEASE NOTE This room caters for adults (over 18 only), bookings made with persons under this age will be declined. Bedding is 2 x Queen Beds. Rate is for 2 people, Max 4 people. 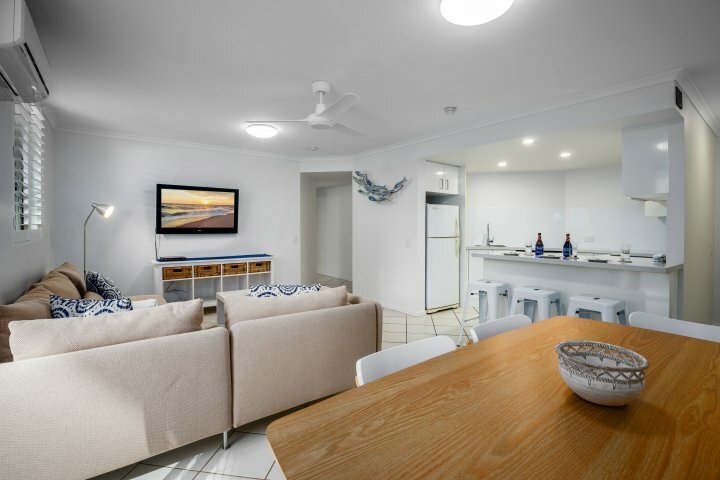 Free Wi-Fi -- This new renovated air conditioned fully self contained apartment has 180 degrees ocean views from Point Cartwright to Noosa. Located on the front of the building over Mooloolaba Esplanade. 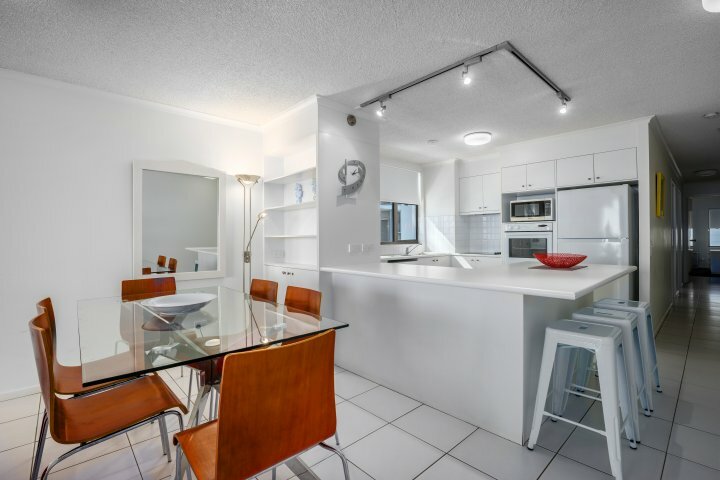 This large apartment has full kitchen and laundry facilities, lounge and dining areas, ensuite and Master Bathroom. 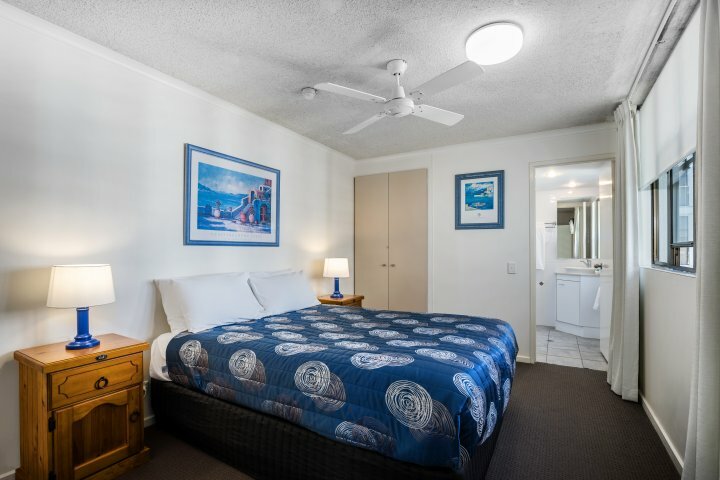 Main Bedroom has TV and Air Conditioner, all bedrooms have ceiling fans. 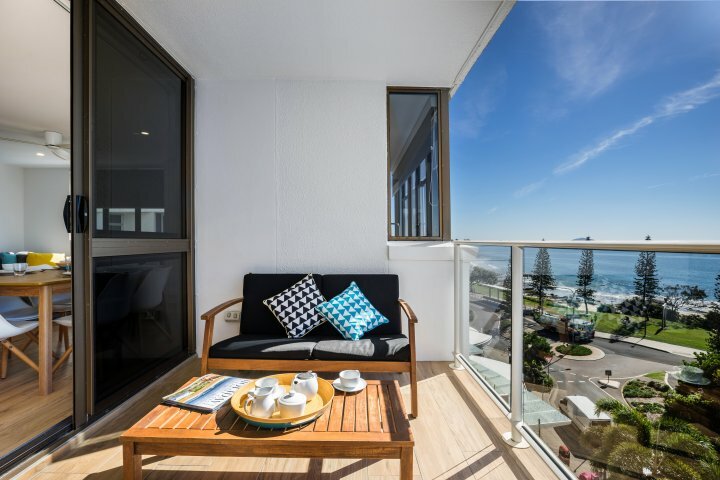 All this in the heart of Mooloolaba amongst the boutique shops and al fresco dining. Please register your arrival at Reception....our Reception hours are from 9am - 5pm Mon-Fri, 9am - 2pm Sat and 9am - 12pm Sundays. We do have late check-in facilities so please let us know your arrival times....late c/in fees may apply. On your arrival, and after the balance of the tariff is taken, we will go through all the Resort facilities and car park allocation. I.D. and credit card details are required on arrival. Please advise if cot/linen or rollerbeds for extra guests is required. Secure Basement carparking available....parking for one car only. Please advise if you require a second carpark. 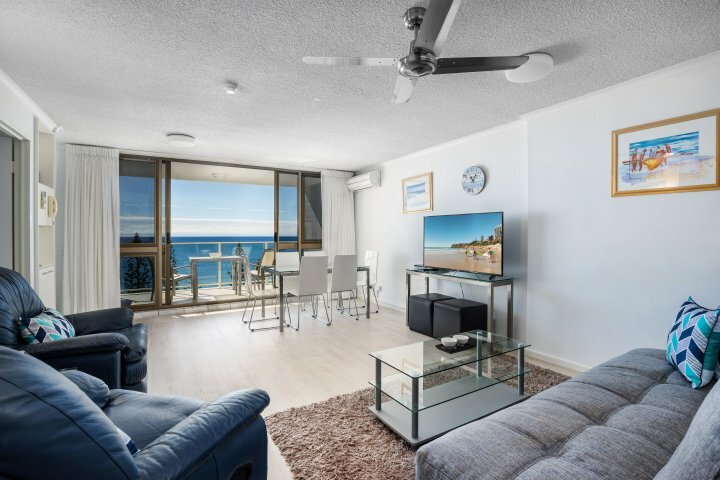 Located in the heart of the Sunshine Coast overlooking the breathtaking views of Mooloolaba Beach, Pacific Beach Resort is centrally located to everything you need to make your holiday to the Sunshine Coast a memorable one. 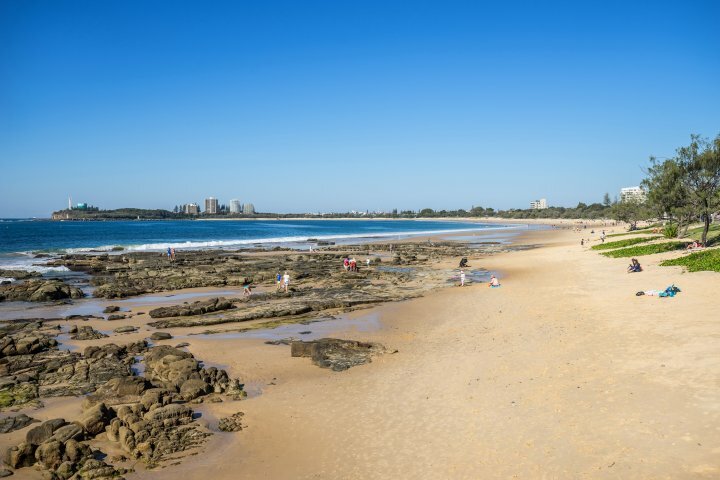 Just a stroll across the road and you are at Mooloolaba Beach, one of the Sunshine Coast's most popular and safest swimming and surfing beaches, and it's only a few steps from your apartment to Mooloolaba Beach's eateries, including trendy cafes and bars, as well as the Sunshine Coast's award winning restaurants and fine dining. 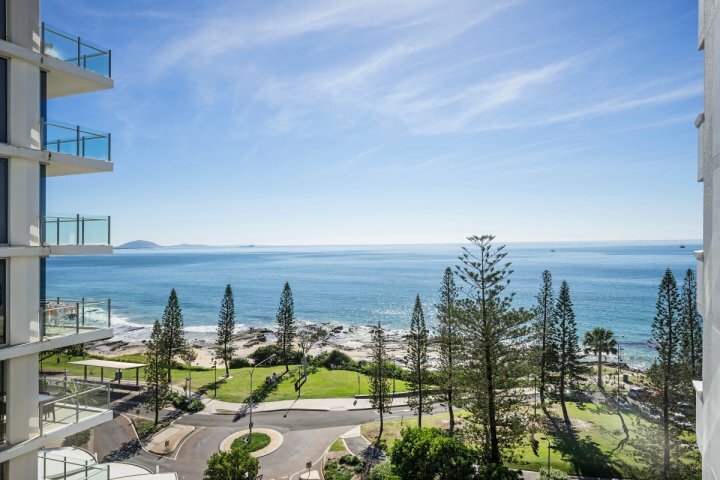 Enjoy a relaxed lunch overlooking beautiful Mooloolaba Beach from the Mooloolaba Beach Surf Club, dine in 5 star service at one of the many restaurants along the Mooloolaba Esplanade, or enjoy fish and chips on the beach! 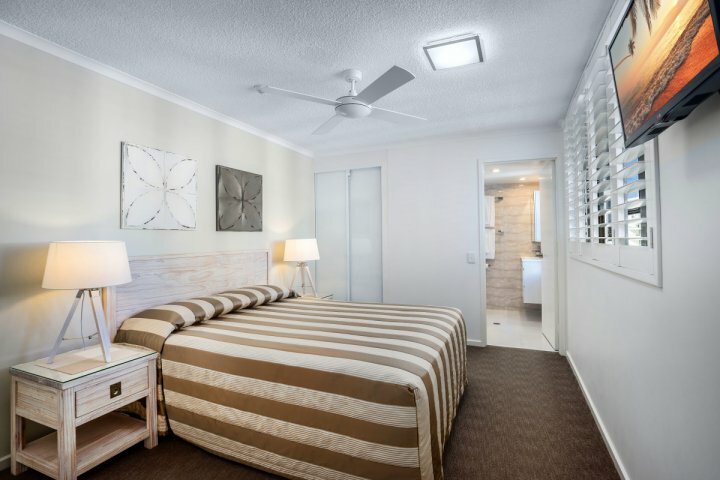 If shopping is your scene, Pacific Beach resort is only a few moments away from the Sunshine Coast's major shopping precincts, with the Sunshine Plaza shopping centre and Kawana Shopping World only a few minutes drive away. There are also plenty of retail fashion stores within easy walking distance of Pacific Beach Resort Apartments. 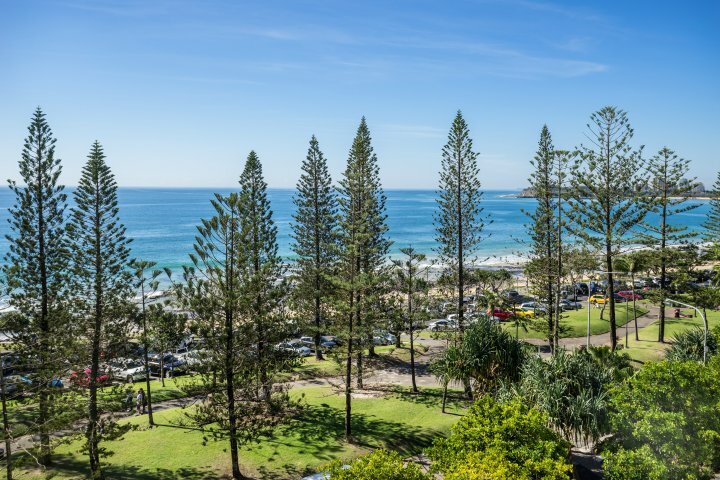 The Sunshine Coast's popular Mooloolaba Beach and surrounding waterways offer the perfect holiday environment if you love your watersports. Enjoy a great day just lazing on the beach, or take advantage of the Sunshine Coast's perfect year-round climate and enjoy a day of Jetskiing, sailing or Deep Sea Charter fishing, and that's just for starters! 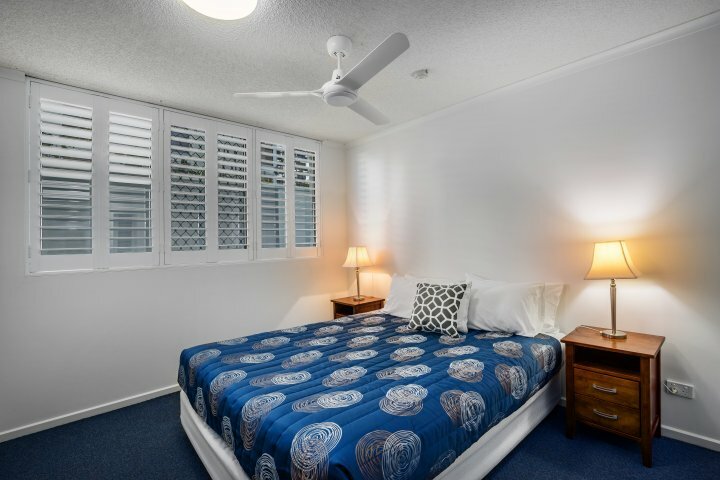 For the keen golfer, Pacific Beach resort apartments are in close proximity to the Sunshine Coast's favourite golf courses, including Maroochy River Golf Club, Headland Park Golf Club, and Twin Waters Golf Club.